SPACE CREW. You’re all rad humans who deserve a post-launch update. First: you should be getting your prizes. The last of them shipped out last week. If you were part of the Space Fleet, one of the top recommenders, or won one of the other giveaways during the campaign, you should have goodies soon. If you don’t see them by the end of next week, hit me up and we’ll figure it out. 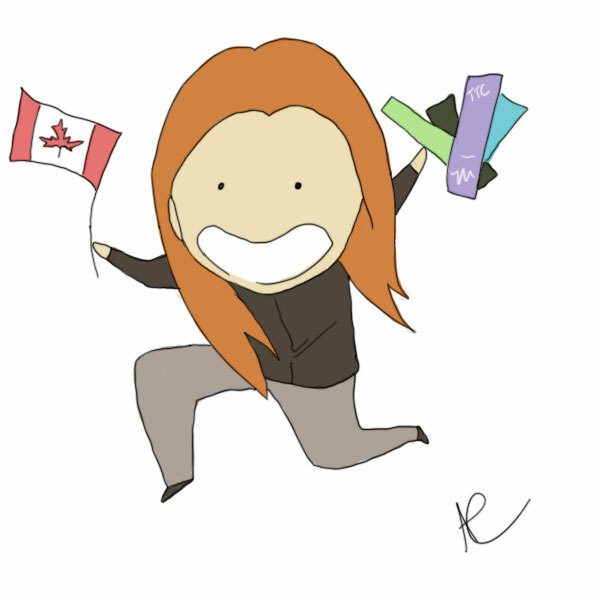 Second: Toronto, I’m coming at you. I’ll be setting up a table at Ad Astra July 13-15. If you’re in the area, come say hi. Plus, there’ll be many other scifi goodies, and you’ll have a chance to meet Ed Greenwood, Robert J. Sawyer, Maria V Snyder, and more cool authorly folks. Third: TTC could use some reviews. I’d prefer not to ask, but there’s some exciting news on the horizon, and seeing a few gold stars on Amazon will only help. If you’ve read the book--especially if you liked it--please take a minute to review on Amazon (US) or Amazon (CAN). Thanks for being a solid crew. Space Crew, brace for landing. You may have already received an updated directly from Inkshares today. I just got confirmation that, yes, your books are being shipped now. Those waiting on e-books should get them May 1. After a lot of consideration, I just don’t think I’m the kind of writer who gets a bunch of pals together in the physical realm. At least not at the moment. I don’t want this to be about me, so much as the book itself. But at the same time, some have expressed interest in some kind of event, so I think we’re going to do an online launch. I don’t have the exact date or method yet, but it will likely take place on some social platform. So please, if this interests you, follow my Facebook and Twitter accounts for updates and invites. You can also use them to show off those physical copies if you become so enthused. Oh, and by the way, WE DID IT. This wouldn’t have been possible without you. Backers, your prizes will come separately, shortly after the launch. Great job everyone! Welcome to the final frontier, Space Crew. We’ve reached the edge of the galaxy, and there’s no turning back. I’ve been through a couple rounds of edits with the Inkshares team since the last update, and this week I sent off the final doc for one last look-over before it hits the printers. The deal is sealed; I can no longer touch this book (which I have very good and very anxious feelings about). No doodle today, because these images are worth more of your data. And in case you missed it, you’ll have your books by May 1! Don’t forget to make sure your address is up to date on Inkshares. Okay, it’s been a bit, but I wanted to have some really freaking great news for you before I put any wish-washy pseudo-updates out. So here goes. We are IN PRODUCTION. Full stop. We’ve blasted out of our old star system into the new, and the destination is in view. Do you know what that means? First it means I have a whole lot of work to do, but this is some fast-tracked, scheduled, definitive (as can be) work. And it also means I have a...how do you say...release date?! 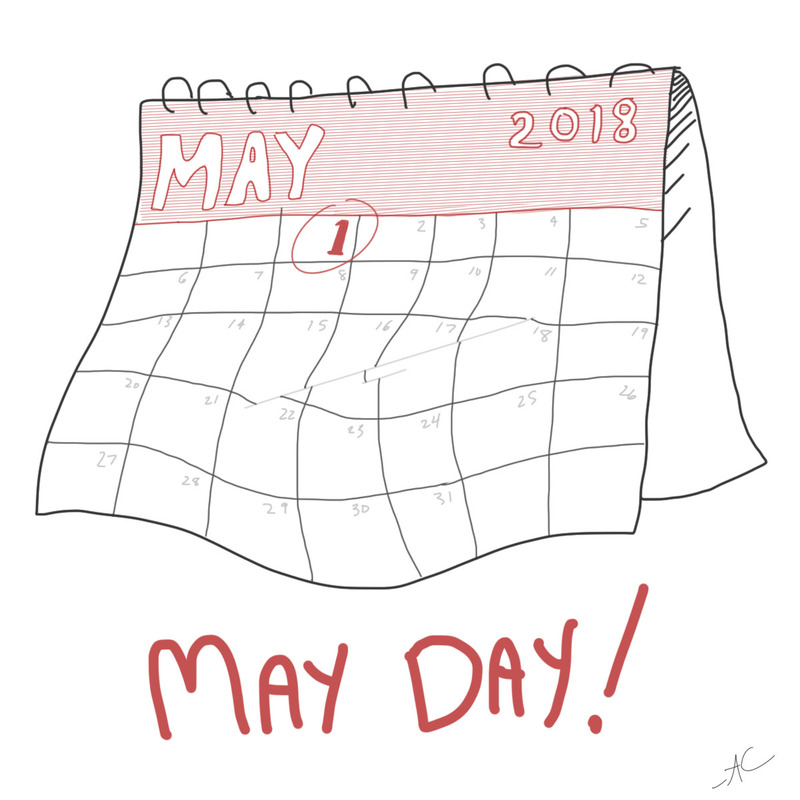 That’s right; this thing is slotted for May Day! It’ll be in your hands before you know it. I hope this news finds you well, and in the meantime I’m working with Inkshares’ editing and production staff to make the book solid, as well as getting together the packages I owe many of you from the campaign. Thanks for your support and patience along this magnificent space quest. You may recall that graphic with the timeline from the summer? Well I checked all my boxes, and we’ve been onto the Inkshares (publication) portion for awhile. I handed in a final manuscript on July 1, and just received notice that production will start in...January! I don’t have an exact timeline on their end to know when the physical book release will be, but rest assured things are moving forward. 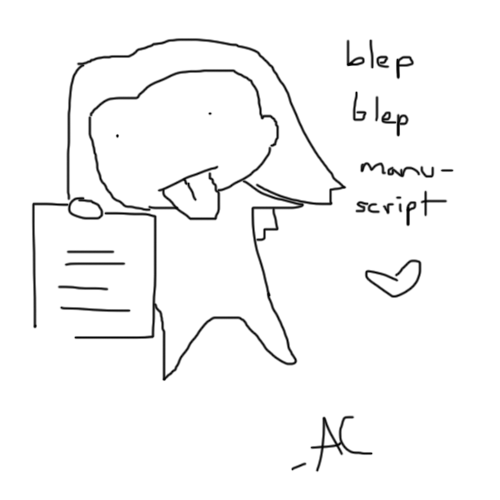 "Excuse me but I want it now"
It would be uncooperative of me to hand you the manuscript, but I can tell you about other projects I have on the go if that helps. About a year ago I made some decent progress on a horror novel, which was an ongoing side project. I have a plan to finish that up during November’s NaNoWriMo this year. It’s currently outlined on Inkshares, though I haven’t yet decided which platform to sell it on. 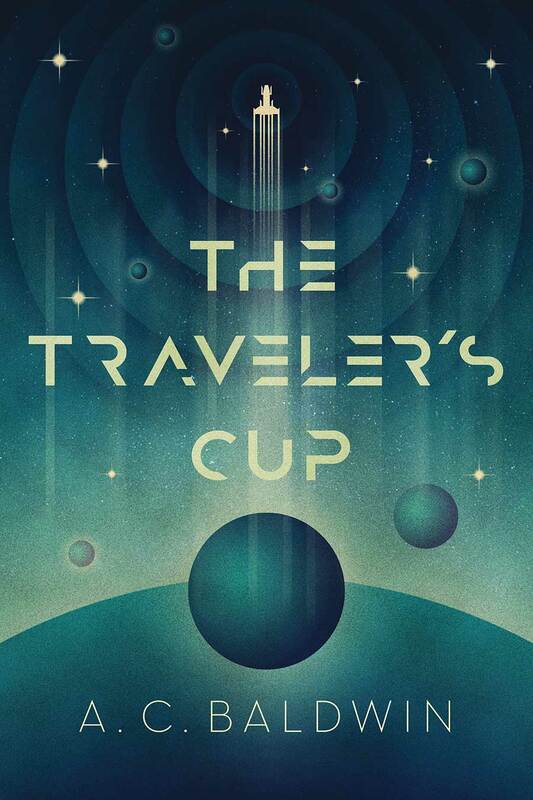 I’m hoping that by Christmas this year I’ll have a way to get e-books into the hands of everyone who supported (and patiently awaited) The Traveller’s Cup. 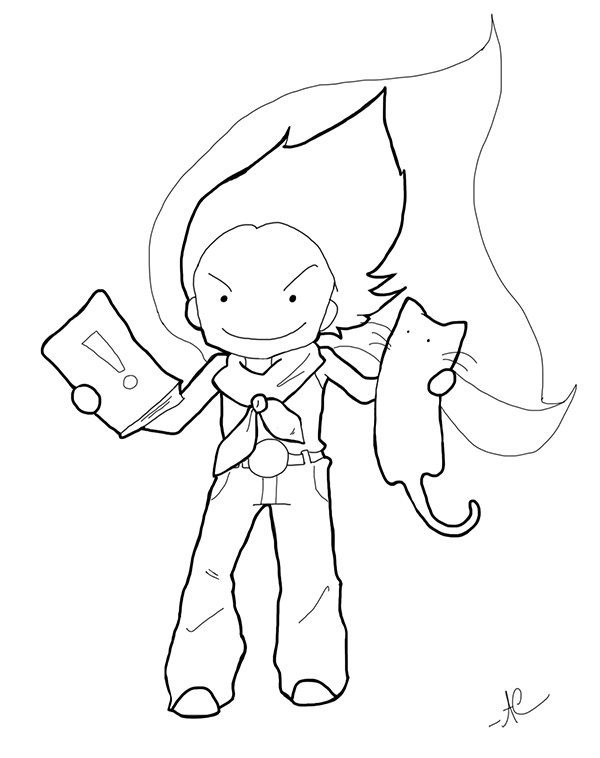 I’ve heard that some of you like the doodles that inevitably end up in these newsletters. 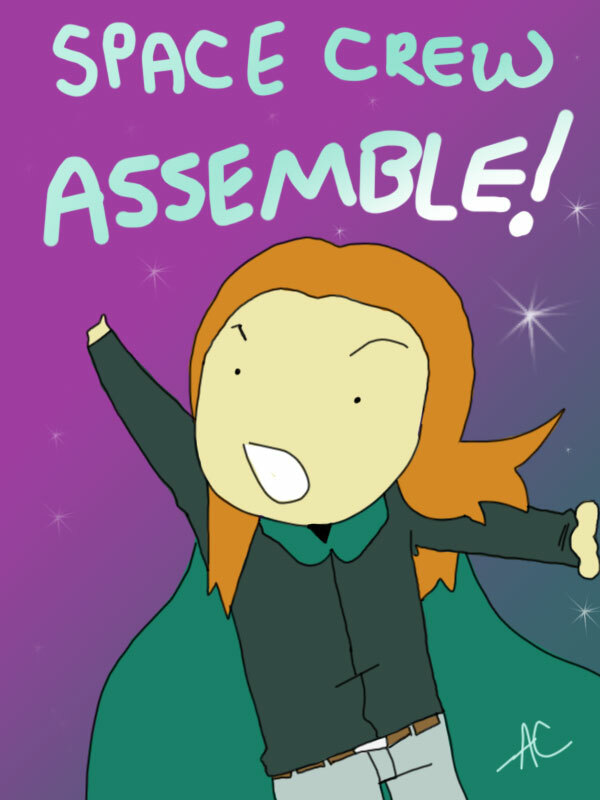 I’ve got a derpy webcomic series in the works that I’m hoping to launch in the coming month. Stay tuned! One thing that rewriting The Traveller’s Cup had me thinking about was how much potential there was for more. I wrote this as a stand-alone, and I plan on sticking to that, but that doesn’t mean we can’t know a little more about our side characters. Once the book is released (because spoilers), I’m planning to put out short stories showing more of the Grey history, and maybe a glance into the future of the universe surrounding Palunos. If these gain enough traction for a decent collection, you might see an anthology eventually too. So, the writing part of this project is currently out of my hands. 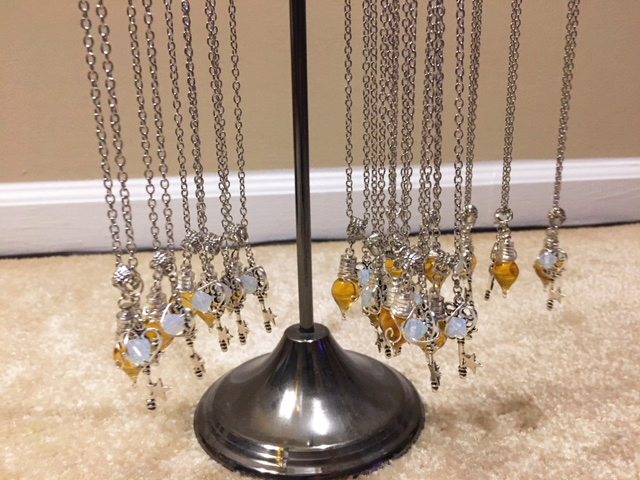 In the meantime I’m getting to work on the companion guides, more custom bookmarks, locking down a cover artist, and ensuring a set of those key and vial necklaces go into production. This is the last leg of the journey, and I couldn’t have asked for a better crew to travel with. This is all a success because of you. 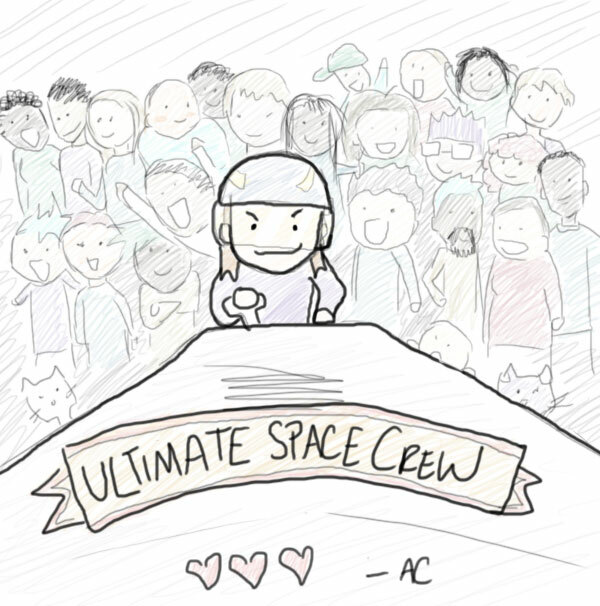 Top of the something, Space Crew! I have emerged from the confines of the writer’s cave to give you all a well-deserved update. Turns out the manuscript, and my mental health, needed more reworking than expected. I am declaring it now, and please don’t scream at me: I am a month behind! So March is wrapping up, and so is this story, finally! At last! The end is on the horizon. I expect that in one week I’ll be finished writing and onto editing. To compensate for my lateness, I’ve made sure to boost the quality of this thing, so I’m expecting editing to take half what I had planned (about two weeks). This means that if you think about it, I’m only a couple weeks behind. Beta readers wanted! The next phase requires a couple of people to read this thing for early feedback. I have some folks in mind, and I have specific requirements, but if you’re interested, hit me up on Twitter (@acbaldwin) or by email at acbaldwinbooks@gmail.com. No promises, but if I need you I will call on you. So that about sums up the remaining work. I’m really excited about this story after a lot of progress has been made, and I can’t wait to make it a reality. Top of the New Year, Space Crew! This is your Captain speaking, and I have a couple months’ worth of news and updates to share with you, so bear with me. What was going on with this book again? I’ve had some questions regarding the book’s funding status even now, so I want to remind you of some great news: we got the greenlight for publication via Inkshares! We officially reached Quill sometime before the funding period ended, so don’t fret; this book will be coming out and you will have it in your hands (or on your reader). I mean, that’s cool, but, like, when? I want to show you a piece of a timeline today. But the thing is, publishing requires a lot of steps. A lot of back and forth. 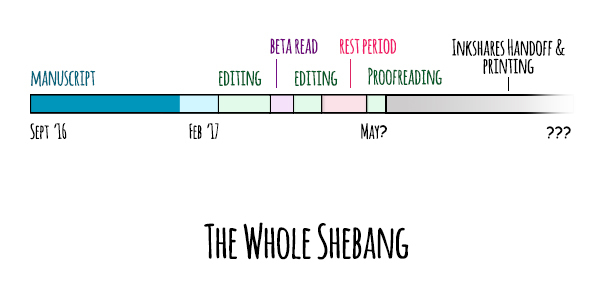 There’s writing to tie up, editing to impel, beta-reading to endeavour on, and after all of that: getting slotted in the ever-expanding Inkshares printing and release schedule. So though this is the question I’ve had the most, I cannot realistically give you an official release date. And rather than risk disappointment now or later, I’m going to focus on what I do know. There’s a huge (huge, HUGE, HUUUUGE!) difference between a draft and a polished, publishable manuscript I’d be willing to share with betas, let alone the world. You’ve gotten some sneak peeks of the writing in my updates, but you may have noticed they’re of variable quality. That some excerpts grip you more than others. But I want to give you a joyride of a book from cover to cover, so that’s just not going to cut it. Also, sometime after the first draft was completed, I realized I had to rewrite about 1/3 of it to deliver a way cooler ending. I mean, I guess I could give you the boring version, but it’s significantly less fun, and I’m all about having an evil plan. So please be patient as I rework the story and weed out any inconsistencies. Well, yes. Some of that is writing. And some of that is the fact that this is my first publication, and I had a lot of life things to take care of so that I could put more focus into this. I spent a great deal of time last year in promo, and it nearly wiped me out, to be honest. It isn’t my strong suit. I love making these newsletters and sending you silly doodles, but campaigning and begging you all to buy copies was far too salesy for my usual taste. As a result of spending so much time on book promo, some other hobbies and professional goals started to suffer. And while in theory "full time writer" sounds great, this is my first publication, so I don’t have that luxury. Thanks. I’m glad you do. And for your understanding and compassion I will make sure you get a book that is filled with fun, fear, and adventure. So what can you tell me about the timeline? Here’s the manuscript alone. I have no reason to believe it won’t be done in February. Now, I know you want the big picture. 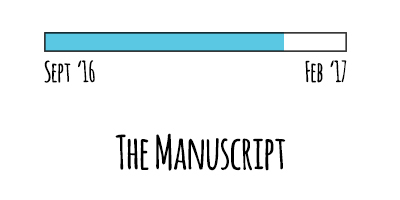 Especially you writer types who are giggling at the idea that a finished manuscript is actually ever finished. I can only approximate here, so the idea is to show you the steps involved and tell you why they’re so important. The actual writing will be wrapped up soon, but then we have crucial items to address to make sure you’re getting a quality product. Editing Round 1: This is a full edit. I’m looking at story structure, content, consistencies, spelling, grammar, etc. It usually means I print out the whole thing and go at it with several coloured highlighters. Beta Read: At this point I’ll have convinced myself the book is in as good a state I can procure. I’ll be wrong, and I’ll need the help of others to show me that. I typically use two trusted beta readers to give their honest feedback about the story. They also tend to catch typos I’ve missed. Editing Round 2: I sulk a little before admitting my betas are right, and then hack and slash the manuscript a little more. Rest Period!!! This is a period of intentional slacking. But it’s so much more than that. This is the proverbial "throw it in a drawer" so that I can get enough separation to read it one more time with fresh eyes. I tend to come back able to see issues with tone of voice, flow of story, and more grammatical errors, or at least cringey uses of language. 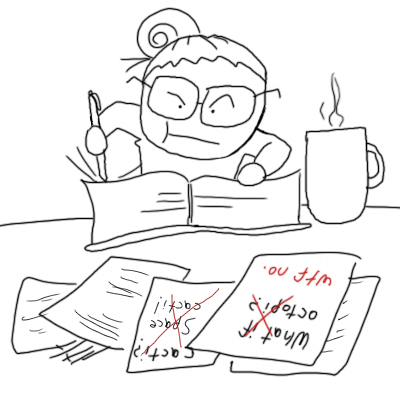 Proofreading: I fix the aforementioned issues discovered in the Rest Period. I go through the whole manuscript, but I’m no longer looking at the story. It’s all about voice, flow, and individual words. I tacked "May" onto this, timeline-wise. I almost said April. It might be April. But I don’t want to just give you the best-case scenario, so let’s assume it’s May. Processing and Printing: This I can’t yet give any info on. I haven’t done it before, and while I’ve heard from others about their experiences, I know that each author will have their own publishing experience. I am publishing under Quill, so I won’t have as much back and forth as the fully-funded folks, who get most of their editing and pre-printing work done in house. But it is up to them to tell me my story is good enough and to schedule its release. Also I will have other tasks that go along with that, like a final cover design, blurbs, and eventually signing many of your copies. So, Space Crew, this is what it’s looking like. I hope it isn’t disappointing for you. As it turns out, writers are people, and writing professionally is about a lot more than writing. I also hope you still believe in this book. Let’s make 2017 a spacetastic year. The final hours are upon us, Space Crew. Look at all the things we’ve done. Over 300 copies of this book are going to go out in due time, guaranteed. If any of you are miraculously waiting to order 450 more, I’ll take it, but I’m really happy with our progress. When I have some time to sort out all the thoughts and feelings in my brainspace I’ll send out another update, but for now I just want to say thanks, and welcome to the Crew for anyone’s who’s joined us on this final push. Let’s all spam our networks one more time and then rest easy knowing this space book has become reality. Reusing an old doodle because I don’t have my tablet to draw with at the moment and I’m feeling sentimental. This is it, Space Crew. The final days of the campaign. I’ll get all sappy later on, but right now we’ve got work to do. Redditors, man your book subs. Twitterers, ready your fingertips. Facebookers, prepare your feeds. We need to make this book explode. PS: If I sent you book spam today, it means you haven’t ordered yet! It’s the Final Countdown, Space Crew. This is the ultimate showdown of ultimate destiny. It’s the end of this campaign as we know it, and most of you probably feel fine. We’re so close, no matter how far. I’m...running out of relevant lyrics. This Campaign is Ending in Less Than a Week. Funding for The Traveller’s Cup will officially be locked down on September 15. That’s Thursday. And while I know that seems like enough time for you to do it later, and you’re definitely sure you won’t forget—I’d like to inform you that today is your Space Captain’s birthday, and I’m turning old years old. So if you feel enough pity for me today, you can send your consolation in the form of a $10 e-book order. I’d also like to remind you that at 300 orders I’ll be releasing a theme song. And well, that’s only 8 orders away! Plus, doubling that once or twice would be great if any of you can work some internet magic, so we can be fully-funded at 750 orders. I Am Going to Can-Con Today! I’m pretty stoked. Gonna learn about book-writin’, gonna meet some authors/agents/literary folk, and network with some pals I have not met enough in person. And the majority of this event is focused on fantasy and sci-fi, so I’ll be in some very good company. If you’re heading there too, hit me up on Twitter @ac_baldwin, and we can chat or possibly grab a beverage nearby. I’ll also be giving out some TTC bookmarks.